The simplicity of Trillium’s grist of barley and wheat delivers a wonderfully complex, yet approachable, American farmhouse ale. Our house farmhouse yeast blend, along with American hops, drive a distinctive character in this rustic, unfiltered ale. Trillium expresses a beautiful nose of peppery spice, coupled with flavors of fermentation-derived fruit and more pepper. Firm bitterness and effervescent carbonation combine with a satisfyingly smooth mouthfeel from the wheat. The beer pours a hazy, straw yellow, almost green, with a nice little head of eggshell white bubbles that fizzles quickly into a tight scrim. In body, the beer is nicely hazy and appealingly pale with little of the other side of the glass coming through. On the nose, the beer smells of crisp, stale crackers and fresh hay, a touch of funk, and a light lemon pop on the end of the whiff. As you stick your nose deeper into the glass, the hay moves more towards freshly cut grass, pepper, and a faint and appealing brass scent. This beer smells wonderfully like a saison. On the tongue, the beer tastes nicely wheat-malt sweet with a medium bitter finish. A light, acidic pop comes throughout the taste and gives the mouth a nice bite. In flavor, the beer begins as light wheat flake flavors which slowly blend into a beautiful bitter flavor of fresh cut grass and peppers that dips towards lemon bread with a bright citric pop on the tongue. The finish brings a light caramel into the flavor, which blends beautifully with the wheat flake and grass flavors to crescendo in a dry, yet refreshing snap on the tongue. The aftertaste is softly bitter with grass and hay, with a lingering hint of wheat flakes. On the tongue, the beer feels on the light side of medium in body with a crisp, snappy carbonation that cuts lightly across the palate, scrubbing the tongue dry and leaving the mouth begging for another sip. The sides of the mouth, meanwhile, pucker slightly and wet with acid canceling saliva. Overall, this is a hugely refreshing saison with some beautiful complexities. It has some similarities to Mystic’s Saison Renaud, but this beer brings more of the grassy hops into the flavor and puts a nice balance between the malt, the hops, and the yeast. The mouthfeel is a little rough but the balance is hugely impressive, and very tasty, proving some major skill on the brewer’s part. I like this beer and I can’t wait to try more! Poured from a 750 mL bottle into a snifter. I don't see a bottle date, but I picked this up at the brewery last week. Appearance: Pours a slightly translucent medium amber/gold and leaves a couple fingers of fluffy white head, which take some time to fade to a small fluff, leaving plenty of lacing. Smell: Big lemon zest, fresh peppercorn, slight hay funk, white grape skins, citrus rinds, some earthy tones. Taste: Bready malts, peppercorn, some cloves, lemon rinds, lemon zest, citrus hops. The bready/yeast flavors are the most prominent, but there are some nice varieties of flavor in here. Mouth-feel: Well carbonated with thin to medium body. Finishes crisp and a little bitter. Overall: This is a nice, refreshing saison. Fairly straight forward but with some nice flavors to it. The aroma is really nice as well, with prominent lemon and pepper flavors. A good beer to kick back with on a nice, sunny day. T- Once again the esters from the yeast take over along with some great spice. M- It could be that I travelled back to New York City with my growler, but the carbonation was pretty light. I generally like my saisons with slightly more carbonation, but considering I have sampled this beer during test batches, I'll take the carbonation level as a fluke. 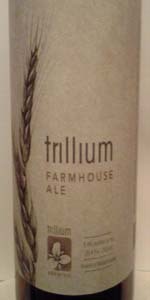 Overall, Trillium is a very easy drinking beer which I can see myself drinking regularly. Can't wait for the sours to be ready, because I know what J.C. is capable of when it comes to sour and barrel-aged beers. bottle from 4/20 classic farmhouse w some bright citric notes. very American saison....has the earthiness that the classics have w a candied sweetness over the top. very enjoyable. Hazy pale golden in color with a white head. Aroma is peach, pears, bit of spice and a little sweetness. Flavors follow but the aroma is a tad better than the flavor. Just a hair sweet for me as well. But overall a really great beer.